It was 1 a.m. as I slogged my way out of the Bangalore airport, laden with luggage. Swathi was standing by Subway when she saw me and rushed forward to greet me with a hug. To my relief, she was not wearing any perfume, and only smelled faintly of the shampoo she uses. I had been slightly anxious about how she would smell because of a scented letter she sent me earlier in the year. Fears about of her smell were quickly replaced by the sudden awareness of the other smells around me. Driving away from the airport in the taxi, I could see cows and dogs rummaging through the mounds of trash on the side of the road. The driver stopped on the side of the road without warning to partake in some tea a man was selling on the side of the road, then resumed honking and swerving around the other taxis on the road. He complained to Swathi in Hindi about the other drivers being asleep. Eventually, we made it back to her place without incident. 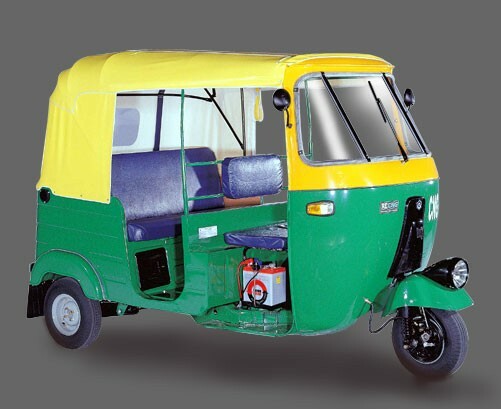 Swathi and I are getting along just fine and have been exploring the city by three-wheeled auto rickshaw and motorcycle. She has been taking excellent care of me, making sure I get three meals a day and am drinking plenty of purified water, which she keeps on hand in abundance. I have not yet gotten sick, and am already completely accustomed to the time change. 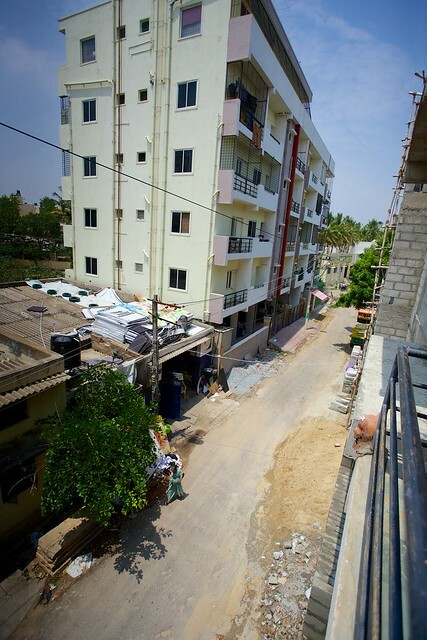 Swathi lives on the third floor of a concrete house owned by a man who lives with his family on the second floor. This house is built in the traditional manner, using rebar, concrete, and brick, with a parking area and underground water tanks on the first floor, and an open terrace on the roof where she dries her clothes using a line. 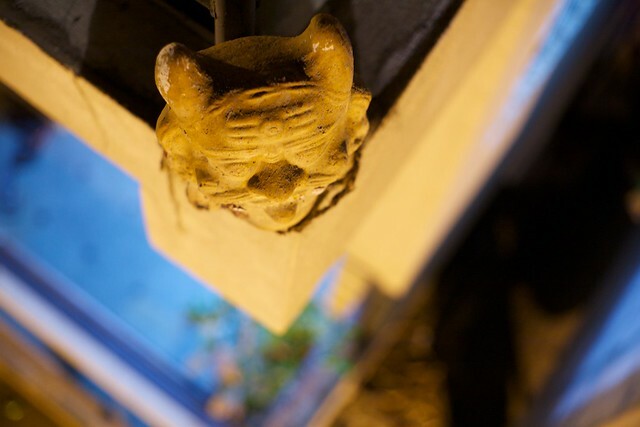 In south-Indian fashion, a gargoyle is perched on the corner of the property. Water for the house comes from water tanks on the terrace. Water pressure is courtesy of gravity, and a manually-activated pump moves water from the ground tanks to the terrace tanks. Care must be taken to not leave the pump on too long, or water will be wasted on the roof. A tanker comes when requested to periodically to refill the ground tanks. The house faces an alleyway where children play cricket and dogs laze, panting in the heat. The neighboring plot is under construction. As with most buildings under construction, its bare concrete and rebar are an eyesore. I found it difficult to tell whether a building had fallen into disrepair, was recently a victim of terrorism, or is in process of being built. 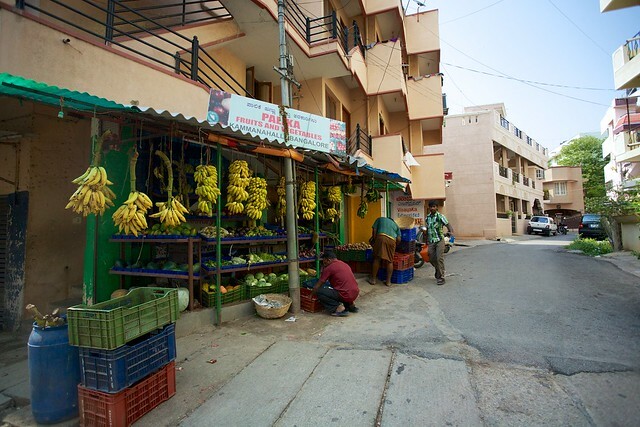 Just down the road is a small vegetable shop Swathi frequents. 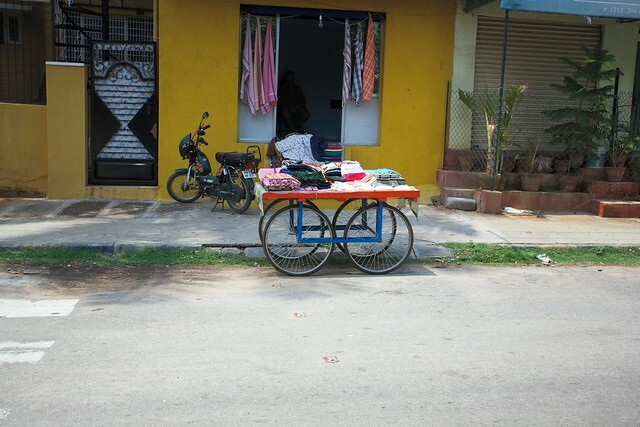 Bicycle wheels and steel bars serve as carts for selling and transporting goods. Once we had settled in and she had shown me the area, we headed over to a nearby mall to watch the new Star Trek movie. The film was interrupted halfway with an abrupt intermission for snacks, which she tells me happens in every film shown. We picked up some caramel popcorn and orange juice, then shuffled back to our seats. Afterwards, we ate a traditional Indian (Punjabi) meal. and at the request of her Aunt, picked up some Indian clothes for me. We then hopped on her motorcycle and headed back but were caught in a downpour, which only added the chaos and excitement on the roads. The torrential rains subsided after we dried off. This allowed us to go back out and meet with two of her friends at a local hangout called “Rewind.” There, we ate more Indian food and conversed about their recent trip to Goa. I sampled two varieties of the Indian beer, Kingfisher. Ads are everywhere for the brew, and despite Swathi’s warnings, I wanted to know what all the marketing was about. After I had tasted both the “premium” and the “blue”, I can safely say that in every respect, it is just as foul as Swathi had said. Calling Kingfisher a beer is a stretch of the imagination. India is very hot, there is trash in the streets and the drivers are insane. India’s third-world roughness contrasts its occasional first-world comforts, producing a charm which is captivating and inviting. I look forward to exploring it more over the next few weeks. 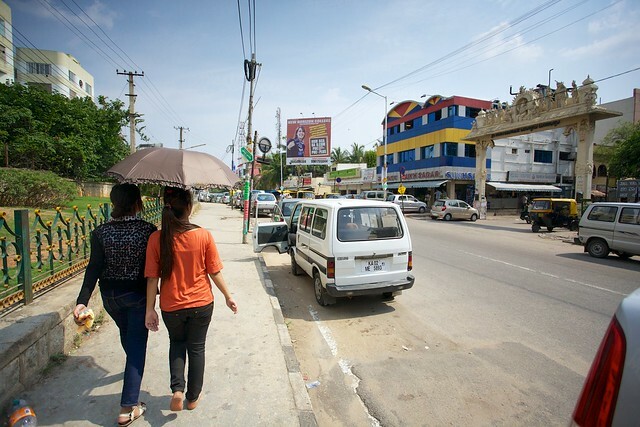 Swathi has not purchased a car yet, so we need to re-formulate plans about where we will be going and how we will get there. One thing is certain though, and that is our trip by train to Hyderabad tomorrow to visit her family.